Yesterday we had a late winter snowfall, getting about five inches of new powder added to the snow pack already on the ground. This winter in Northern Wisconsin, we have not received the huge, single snowfalls of one or two feet as have some areas of our country. I heard that on the east coast, in a part of our nation that we in America call New England, there were places that had a single snowfall of three feet and even more. We have not seen that here at our farm; just four or five inches at a time. Even with that, there is now getting to be a considerable amount of snow in the woods in our part of the country. I have to pick up my feet quite high when I walk. Skis or snowshoes are not an option when one is working. During yesterday’s snowfall, I looked up from my work for a moment to watch the snow falling. I was struck by the pure beauty of the flakes coming down from the sky. So enthralled was I by the scene that I put down my chainsaw and shut off my tractor so that I could watch it fall. I sat down on a log for a good long time, watching in silence. It was midday, but because the cloud cover was very heavy and the trees quite large in the area where I was working, the woods were much darker than they normally would be at that time of day. The softness of the light added to a mood of the woods, which, if I had to choose a word to describe it, I would call solemn. It was so incredibly peaceful that, in reality, one cannot describe it. It is one of those things that can be understood only by experiencing it. The silence of the scene was also astonishing. I could tell by the stillness of the tree branches that there was absolutely no breeze blowing. The snow was falling straight down. It was so quiet in the woods that as I sat on my log, I began to realize that I could hear the snowflakes sifting down from the sky and landing on the top of my hard-hat. I took my hat off. At first I heard only absolute silence. I could hear no sound at all. There were no animals running around and no birds chirping. Then slowly, I began to detect a gentle and quiet whisper. At least that is what I guess I would call the sound; or perhaps it would be better said, a hushed and prolonged sigh. I realized that the sound I was hearing was the hum that the snow was making as it was falling through the air and landing on the branches of the trees and on the ground. I was hearing the voices of millions of snowflakes. This was not the falling of snow pellets or snow with a high ice concentration. When these are falling, they almost shout in comparison with the snow that was falling around me. The snowflakes that I was hearing were the gentle crystals that fell so slowly that their soft landing did not even break their delicate structure. Just this winter I learned a new term for snow that I did not before know. This I learned from our local Rhinelander, Wisconsin TV weatherman. Snow comes in various forms. Sometimes it is almost like small pellets and sometimes even like tiny prisms (plus several other forms), but the snowflakes that I was watching as I sat on my log were dendrites. The word means tree-like. 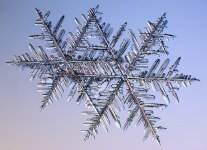 This type of snowflake is so named because the flakes are in the form of tiny crystals with branches and side branches, much like trees. 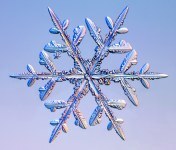 The difference is that in the snowflake, all the branches and side branches have the symmetry of a perfectly formed crystal. I thought it very fitting that these dendrites were falling among the trees and settling in their branches. I also felt that I must be very privileged to listen to their tiny voices as they fell. Were it only one snowflake or a few, I would not be able to hear them. However, with the millions falling around me, together they produced a chorus of nature that I think few people have ever taken time to hear. Perhaps you have. If so, consider yourself fortunate. It was after what was quite a long time of listening to this chorus of the snow, that way off in the distance, I heard a crow. He was so far away and his call so faint, that in ordinary circumstances, I am not even sure if I would have noticed his cawing. However, after listening so intently to the quiet voices of the snow, his caw seemed almost startling to me. It brought me back to reality, and I realized that I was beginning to get a little cold. Time to get up and get back to work; to warm myself up if for no other reason. At this time of year many are getting tired of the snow, and I must say that neither for me is it all dreamy moments of beauty and silence. Nevertheless, the movements of nature and of the seasons are in the hands of God. It is nice, sometimes, to take time out and enjoy what is taking place around us. Like listening to the chorus of the snowfall. As I was watching the TV news a day or so ago, they had a piece about President Obama giving a speech someplace in which he again brought up the horrid episode of the shooting massacre at the school in Sandy Hook, Connecticut. As he spoke of the little children who had lost their lives in the there, he wiped away a tear that had formed in the corner of his eye. Of course, this is the portion of the video clip that made the newscast. It is clear to me that this issue truly is close to the President’s heart. He has publicly shed other tears over the loss of these innocent lives, and he has called that fateful day at Sandy Hook, “the worst day of my presidency.” It is right to shed tears for these lost lives. This is a point about which I earlier wrote (See my blog post, The Innocent Ones, from December 17, 2012). However, there is a problem. The President seems to be taking the perspective that the answer must lie in increased legislation. I agree that there are some bits of legislation that may help (background checks, for instance), but if one thinks that piling on more legislation is the answer, this is not really fundamental change. This is the same old perennial method of our government to think that the answer is to pass more regulation. One of the problematic aspects of this approach is that it butts heads with what many Americans see as their right to keep and to bear arms. This is not just an opinion of a few backwoods rednecks, of course, but one that appears in the Second Amendment to our constitution. The reason that it appears there is that the framers of our constitution knew from experience that it is possible for a government to act not as a protector of its citizens, but as its oppressor. In the view of our founders, the well-being of the citizen was more important than the imposed will of a government. These American citizens may not feel so threatened if they really did see some fundamental changes in our country. After all, this is what our president also called for, although the manner in which these two sides see this change would differ from one another. With the latest technology and medical research, what goes on within the womb of a pregnant woman has become less and less of a mystery to us. Technology has opened a window into the womb for us to see how a baby develops, and medical research has confirmed it. It is difficult for me to imagine that any unbiased person could look at the photos and videos from within the womb, read the research, and say that it is simply a blob of flesh that does not yet possess humanity. Speaking from a purely scientific perspective, it is becoming increasingly difficult to deny that this is indeed an unborn human child, with individuality and even with personality. Even with this evidence, we as a nation seem to have no trouble rationalizing well over 1,000,000 abortions every year. Somehow, we have convinced ourselves that this is a price worth paying for the right of a woman to control her own reproductive choices. I know that there are some very difficult circumstances in our society where there seems to be no good solution, but with the technological and medical knowledge that we possess, we must realize that every abortion involves the death of a person, an innocent person. That means over a million innocents killed every year. As I have said, in the gun debate, we also hear of rights; specifically, the right to own and bear firearms. As a result of this right, we have almost 270,000,000 rifles and handguns owned by private citizens in the U.S. Sadly, many of these guns are involved in about 11,000 homicides annually. That is a lot of gun related homicides and shows a need for a fundamental change in our country. But let’s compare the two cases, both involving death of innocent lives. Let us also see if we can balance these distressing statistics with the rights that the people involved believe is theirs. You may dispute my math, but speaking on an annual basis, 270 million guns killing 11,000 people, means that about .004% of the guns in the US are involved in homicides. Again I will say, you may draw a different percentage, but the point is, a very small percentage of guns are used for violent purposes against another person. Now, compare the right to keep and bear arms that gun owners believe is theirs, with the reproductive rights that many people believe should be given to women. When this right of women is used to legitimize abortions, in 100% of the cases, it involves the death of a human child. 100% of the cases! If we are looking for fundamental change, it seems to me that we should also focus our attention here. I am not placing this blame completely upon the women of our nation, for we are all to blame. It has become our culture. If we believe that human life is granted to us by a Creator God (as I do), do we really think that we, as a nation, will not someday be called to give an account for the over 50,000,000 deaths of innocent lives that has occurred since 1973? Like President Obama, I also believe that we need fundamental change in America. I commend him for shedding a tear for the innocents shot by firearms. Now, let us shed some tears for the rest of the innocent lives lost to violence. The change we need is more than a legislative one. It is a change in our attitudes about the value of a life endowed by our Creator. This is a change that will bring about a fundamental difference. We are just coming out of yet another cold snap here in Wisconsin. The folks here tell us that we have had cold weather this winter more than in several years. By the way, several of you have written telling me of your concern for Cora (see Cora’s Predicament by scrolling down a couple posts below). Cora is fine, and no calf yet. Perhaps she is listening to my advice. The following poem started to come to me one of those frigid days as I was walking across the field on my way home from the woods. The thermometer read twenty below. Much lower still, the cold striking my face. It stung on my cheek as I trudged through the snow. But I had grown weary, not fit for the race. Tightened around me in an icy embrace. Against his cold chest I felt myself pinned. Then he looked down at me and evilly grinned. Then let out a laugh, though he knew he had sinned. Down my collar in front and settle in deep. I wanted rest. I could no longer try. And the hill ahead looked unbearably steep. The wind of the north tempting me with his lie! And looked on ahead to consider my route. I placed my foot down- homeward in the storm. Mere inches closer to the place I’d be warm.